If you’re thinking about getting into wood cutting, we have some good news for you. You don’t need to invest in an expensive set of handmade wood carving knives to get started. All you need is a solid knife or two to get started. We researched some of the best-selling and top-rated products to help you find the right one for you. Before we get started, let’s take a look at some of the top features to look for. Pieces: We found a really nice mix of options when it comes to the number of pieces you’re getting. Some of our picks are just one really awesome knife. Others are sets of anywhere from 3 to 12 different knives. Handle Material: All of these knives have wooden handles. Most have them have been shaped to fit the ergonomics of your hand to prevent pain and fatigue. Some are even treated with finishing oils to create a nice grip. Case: Some of our picks come with a carrying case, some don’t. While it’s nice to have a carrying case, we only really think it’s essential if you have a large set with a lot of pieces to keep together. Carbon Steel Blades: Carbon steel is really strong and durable. Plus, it can be sharpened to a razor sharp edge and keeps it for a long time. There are other materials that are pretty good, but carbon steel is the best. Blade Length: Blade lengths actually vary quite a bit. They typically range between 1 ¼ and 2 ½ inches. Some of the sets have knives that have blades that are all the same length while other vary. Guarantee: Some of these products come with a money back guarantee. Check the fine print for the item you choose to be sure. If not, don’t worry. Some of them come with some pretty decent warranties. 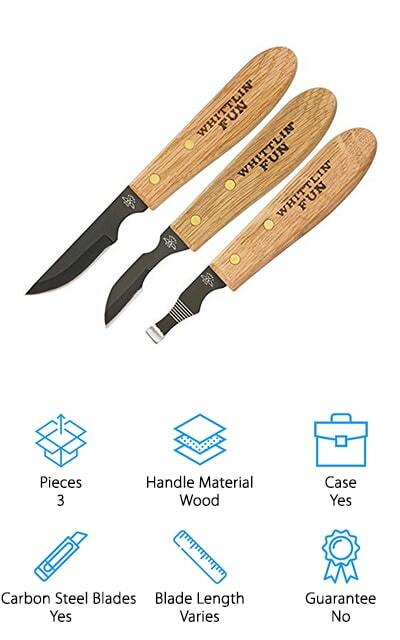 Now that you know a little more about what to look for, let’s get into our best wood carving knives review. Here’s how it works. We put out top and budget picks first. That way, you can get a good idea about the range of items available even if you’re in a hurry. Stick around if you can, though, there are some really great products here and they all have a lot to offer. Okay, are you ready? Let’s get right to it. 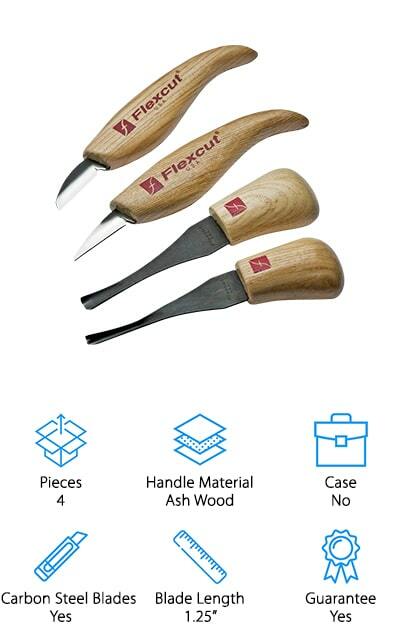 Our top pick is this set of quality wood carving knives from Flexcut Tool. This set includes 4 tools: a cutting knife, detail knife, sweep gouge, and a V-tool. With the combination included in this set, you can do a lot of different things, including fine details and cuts that require a lot of control. The blades are made of hard, durable high carbon steel and each one is razor sharp right out of the package. That’s not all. The shafts are flexible so you get amazing control over the blades while you work. All of the handles are made of ash wood and are ergonomically shaped so you can use them for long stretches without any hand or wrist pain. While there is no case included, this set includes a voucher for a free tool roll. This Morakniv Wood Carving Knife is our budget pick and it’s really a great knife for the money. The narrow, pointed blade is made of laminated steel and has a durable edge that holds its edge for a long time. That’s not all, it’s flexible, too, so you have a lot of control and can really get a lot of fine details. This blade has a full tang that runs the full length of the handle for added strength and stability. Another great feature of this knife it the handle. It’s made of oiled birch and is slightly larger in size so that you can get a better grip and more control. One more thing, Morakniv is a brand you can trust. It’s been making tools for wood carvers and carpenters since 1891. 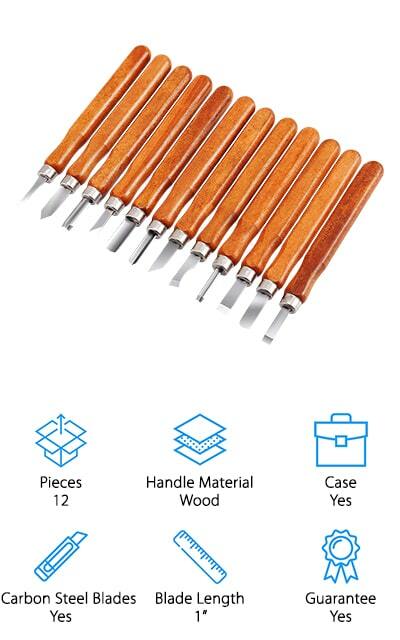 If you’re looking for a set with a lot of different types of wood carving knives, take a look at Gimars Wood Carving Knife Kit. This set has everything a beginner needs to get started. It has 12 different blades altogether, including deep, medium, and shallow gouges, narrow and wide straight chisels, a rounded chisel, 4 angled knives, and a pinpoint tool. These tools are great for soft woods like pine, hickory, or poplar. The blades are all made of high-quality carbon steel with an electrolytic coating for added durability. All of the blades are the same length and they all fit nicely into the plastic case. One more thing, the wooden handles are strong and sturdy but comfortable enough that you won’t have to worry about discomfort or blisters during use. Next in our list of top wood carving knives is this versatile carving knife from BeaverCraft. This is a great choice for general wood carving and is ideal for beginners. It has a fine tip that makes it versatile enough that it can be used for more delicate cutting and detail work. The blade is made of high-quality carbon steel that’s hardened to just the right firmness. It’s also sharpened and polished before it’s sent out so it’s ready to go as soon as you open the box. The handle is great, too. The ergonomic shape is made from hardwood oak with natural linseed oil. It’s designed so that you can use it for a long time without experiencing hand fatigue or discomfort. It includes 3 free eBooks about knife sharpening and how to prevent rusty knives. 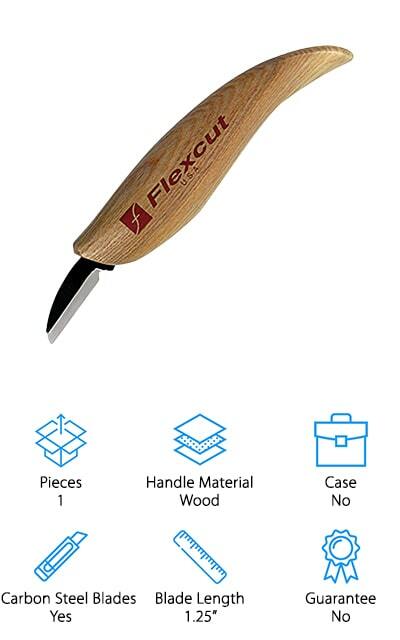 The Flexcut Cutting Knife is a great choice for beginners and a solid tool that experienced wood carvers will come to rely on over and over again. This is an all-purpose carving knife that has a rounded point that’s easy to control. The hard carbon steel blade is exceptionally durable and razor sharp. In fact, it’s already sharpened and ready to use right out of the package. The blade is a nice length, too, perfect for a lot of basic wood carving jobs and a great way to start your collection. Another great thing about this knife is the handle. 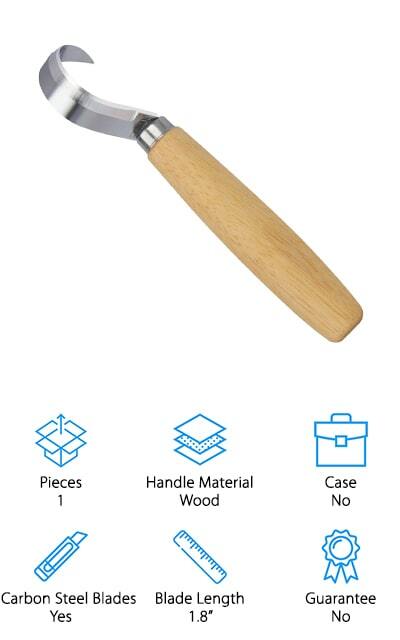 It’s made from ash wood and has a great ergonomic shape so it’s no sweat using it for prolonged periods of carving. This knife is proudly made in the USA and comes with a limited lifetime warranty. Next up is the Boker Carver’s Pocket Knife. This is a unique knife in that we haven’t seen anything like it yet. Why do we say that? 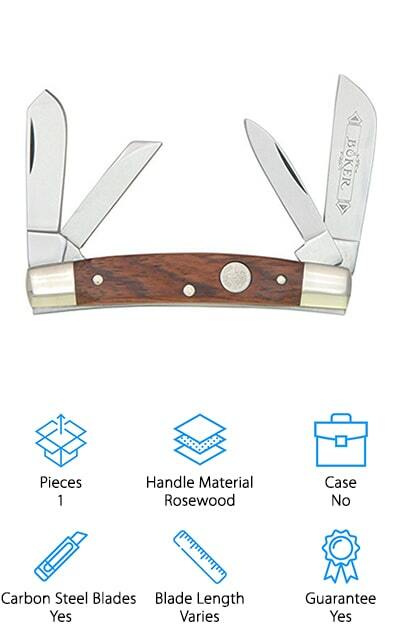 This is actually a pocket knife that has 4 different collapsible blades: sheepwood, coping, pen, and spey. All of the blades are made of durable, razor-sharp carbon steel that make this a perfect all-in-one tool. That’s not all, the blades are really stable when they’re out of the handle. Each one is equipped with a backspring that makes them easy to get in and out and keeps them firmly in place once when they’re ready to use. When all of the blades are inside the beautiful rosewood handle, it’s only 3.75-inches long, the perfect size to tuck into your pocket or desk drawer. If you’re looking for an awesome hook knife, you’re in luck because we found one. 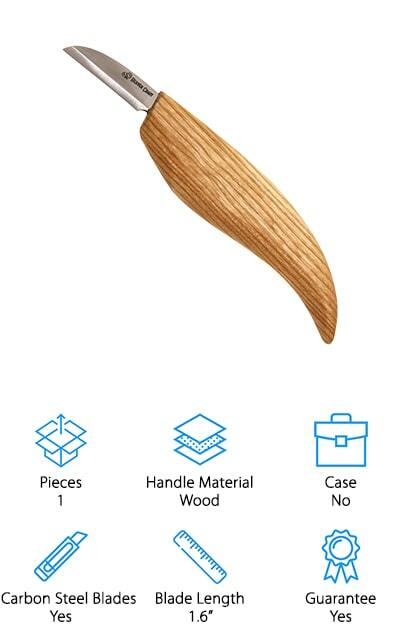 The SIMILK Wood Carving Knife is a great choice for carving wooden spoons, bowls, cups, basically anything with a concave shape. That even includes pumpkins! This knife has a high carbon steel blade and is sharpened and ready for use right from the package. It’s meant for softwoods like oak or walnut and makes smooth, shiny cuts that give a really nice finish. This knife was designed to make quick and accurate cuts and has generous hand clearance for extra safety. The handle is really awesome, too. The ergonomic design is comfortable to use, even for long stretches of time. It’s made of oak hardwood and processed using natural linseed oil and has a really beautiful finish. 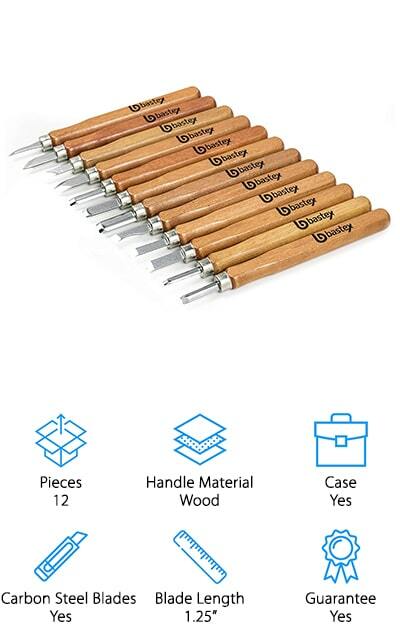 The Bastex Wood Carving Set may not be custom made wood carving knives, but they are a great set for anyone just getting into wood carving. There as 12 pieces in this kit, including several different gouges, straight chisels, and several angled knives just to name a few. Each chisel is the same length to fit nicely into the case. The blades are made of tempered steel and each has a hardwood handle that’s designed for precision. They have a wide base that’s easy hold on to and control. And here’s the kicker. This knife not only comes with a 30-day money back guarantee, but it also includes a 1-year replacement warranty, too. If you’re looking for a set for a beginner that’s also a good investment, this one from Bastex is a great choice. 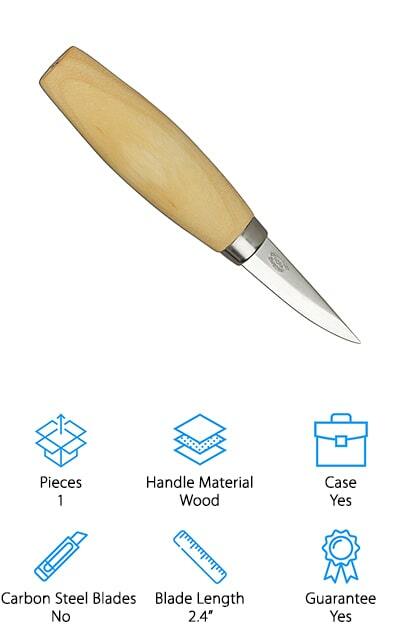 For a great set of custom wood carving knives, take a closer look at this one from Mastercarver. This is a nice size set that works well for both left and right-handed users. 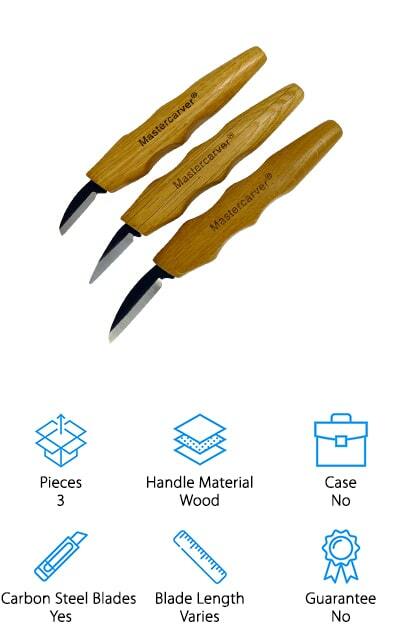 It includes 3 of Mastercarver’s most popular shaped blades which makes it really versatile, too. Each blade is made of hard, razor-sharp carbon steel and come ready to carve. Each one is a slightly different length, either 1 ¼-inches, 1 ⅜-inches, or 1 ¾-inches. The hardwood handles on these tools are one of the most unique things about them. Why? They have a naturally shaped grip that’s comfortable to hold and helps you keep a lot of control. That’s not all, they’re finished with Tung oil for a smooth finish that actually prevents skin blistering and discomfort from extended use. Last up in our list is the Old Forge Wood Carving, a gorgeous set of 3 knives that resemble hand forged wood carving knives. Each blade is made of premium carbon steel that’s hard, durable, and sharp. They’re ready to get to work right out of the box. And get this, while some of the knives we reviewed are only really effective on softwood, these knives are so sharp you can even use them on hardwood, like oak or walnut. The handles are really great, too. They’re ergonomic and comfortable so you can use them for a long time without any hand fatigue or discomfort. This is a really nice set for someone just getting into wood cutting. It gives you the basic tools you need and a great place to start your collection.